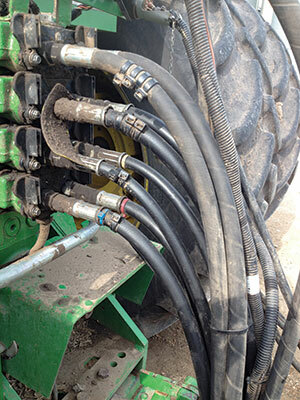 Hooking the hydraulic hoses to our tractor can be time consuming and frustrating. It often takes a couple trips in and out of the tractor to rearrange the hoses for the most efficient way to operate the implement we are pulling. Marking the hydraulic hoses with cable ties will prevent all the problems. We put one cable tie on the first hydraulic hose, two cable ties on the second hydraulic, three on the third and four on the fourth hose to label them. Hooking onto an implement goes a lot smoother now.